This race had been on my radar all along because Wine and Dine is (or shall I say, “was”?) 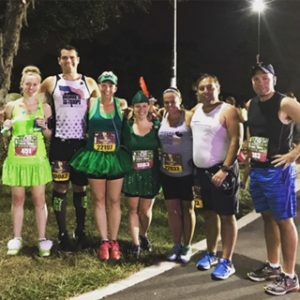 my favorite race weekend of all the runDisney race weekends. I also wanted to run this race because it was part of the Inaugural Lumiere’s Two Course Challenge. With being at Disney for a family vacation with Mike’s family, we had plans the first day of the expo, so we could not get there for the craziness that always accompanies the opening of the expo. Luckily our friend Tim was going because there were a few items that I had to have! I am actually glad that I missed the first day of the expo as we heard several reports that everything was CRAZY. As in huge crowds, huge lines, and some not so Disney-spirit in terms of friendliness in the merch areas. So we made our way over to the expo on Day Two before the Kid’s Races that Mike’s nephews were running. When we got to the expo we decided that the first item on our list was to pick up all of our race bibs since we had to get the kids off and running for their races. Individuals participating in the challenge were able to pick up race shirts in the same building as the bib pickup (for the 10K – a long sleeve burgundy tech shirt with Remy on it; for the Half – a long sleeve grey tech shirt with Chef Mickey on it; and for the Challenge – a long sleeve black tech shirt with Lumiere on it). Our race registration also included a $15 electronic Disney gift card and entry to the after-party in Epcot Sunday night. We then headed into the official expo across the way. We explored the expo a little bit and checked out some of the official race gear. 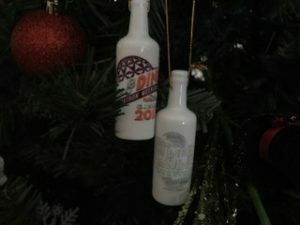 I was happy that they had wine bottle ornaments for the race like the previous year (great collectors item). The biggest disappointment of the expo was there was no QR code to scan at the New Balance booth for rewards points. 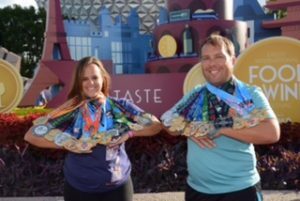 I’m hoping that this was a mistake and they will still continue to have them at future expos (gotta love free runDisney bibs). This race was one of the few runDisney races I have not run in costume. During the Disneyland Half Marathon I was very uncomfortable in my costume for 13.1 miles, so I made a decision for this race I would stick to no costume. 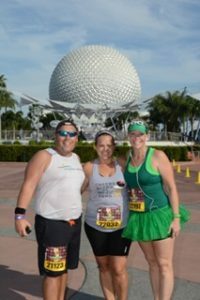 I ran in a race themed tank that read “Cheers, Beers, and Mouse Ears,” black compression shorts, my new Wine and Dine Sweatyband, VSX sports bra, Swiftwick running socks, and Asics Tri running shoes. The first mile started off great. Mike, Helene, and I were keeping a great pace that I was very comfortable as we headed north on Victory Way toward Osceola Parkway. 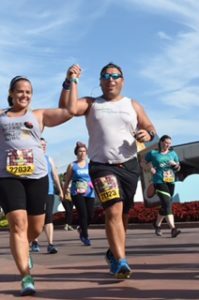 As we made the left to head toward Animal Kingdom we noticed a picture stop not too far ahead, so Mike decided to run sprint ahead to get in line while Helene and I took a walk interval and an adjacent bathroom stop. 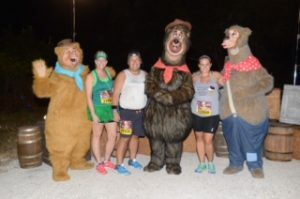 We joined Mike in line for what would soon be a picture with the Country Bears right before the mile one marker, unfortunately the characters swapped out during this time and we had to wait longer than expected. We decided we really liked this whole Mike running ahead of us to get in line for picture stops and that we should continue to do this. 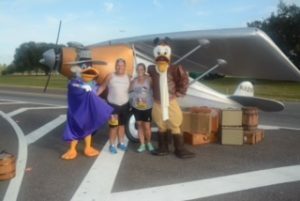 In fact, in a runDisney race first for all of us, we decided on the fly that we would stop for EVERY picture stop on the course. This was going to be fun! The next mile was probably the fastest mile we ran the entire course. We subconsciously decided to make up the time that we lost stopping for the first picture, and that’s just what we did. In the next mile there were no character stops and we realized we should probably slow down a bit or we wouldn’t make it for all thirteen miles. So we trekked on to mile three, which was just inside of Animal Kingdom. 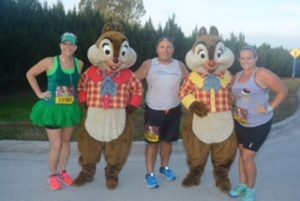 We knew there would be lots of photo opportunities throughout Animal Kingdom, so Mike ran ahead while Helene and I continued with our run/walk/run intervals. I will say there were many great photo ops with characters that are not usually available. We enjoyed pics with Rafiki, Baloo, the Tree of Life, Timon, and Expedition Everest. I LOVED the part inside of Animal Kingdom, it was definitely full of entertainment. The next part of the race was all too familiar, and not in a good way! The stretch from Animal Kingdom to the Magic Kingdom parking lot may be the worst 3.5 miles of any race I have ever run. That being said we headed north on Conservation Way and got to enjoy a photo stop with Meeko before we made a left on East Savannah Circle and then a right on Bear Island Road that put us right by the water treatment plant (stinky). There was a water stop in this area where we felt very bad for the volunteers that had to endure the smell all morning. Once past the water plant Chip and Dale were in site. The next couple of miles were spent on Bear Island Road, with the exception of a down on back on Western Way (a timing mat was placed at the turnaround) to put us back on Bear Island Road. 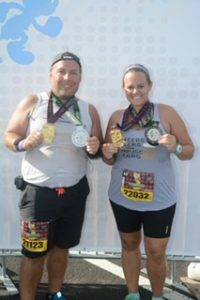 Next it was time for my personal favorite photo stop of the run, Mike and Sully! (While waiting in this line someone near us was tracking the balloon ladies and realized they were about a mile behind us, so we still felt safe stopping for all of the characters – it also served to remind us just how much slower our pace was due to all of these character stops). We continued on Bear Island Road where we wouldn’t have another character stop until right before turning onto Floridian Way, which happened to be Launch Pad McQuack and Darkwing Duck (one of the longest lines we waited in, again due in part to a character break/switch). While waiting in this very long line, the three of us were becoming very hungry. Correction: VERY hungry. If you remember from my Race Preview for this course I mentioned that the Speedway Gas Station would be within reach when turning onto Floridian Way and merging onto World Drive. At this point we decided a gas station stop was a must as we were starving! We all three were really struggling at this point just to have the stamina to finish the race as we were not accustomed to the repeated breaks and waiting around at the character stops (which, surprisingly take their toll on you). Helene and I had decided to do 1 minute runs to 1 minute walks just to keep running somewhat. We began doing this while Mike ran ahead for, you guessed it, CHEETOS! Mike would be remiss if I did not tell you the following. On his way to the gas station, he nearly stepped on a road-killed armadillo (we don’t get these in Ohio!) and everyone inside the gas station looked at him strangely and even commented about what he was doing (he was a sweaty mess at this point!). Confusing strangers who were oblivious that a major race was going on outside was a small price to pay for Cheetos-goodness. Mike rejoined us on World Drive right around the 15K marker with all of the Cheetos goodness you can imagine. Side note** Speedway does not accept Magic Bands as a form of payment so make sure you carry cash or card on you while you’re running. Many of our fellow runners were high-amused by our snack break, and so we shared with them, for which they were very appreciative. Yes – that is Cheesy goodness on our fingers courtesy of a much-needed mid-race stop. After Cheetos and a much needed walk break with a photo stop at Lilo and Stitch we were beginning to feel like ourselves again. It was perfect timing too because it was time to head up the dreaded exit ramp onto Epcot Center Drive. At the top of this hill we were greeted by Andy’s Toy Soldiers from Toy Story who were trying to convince everyone to “Just Keep Running.” At this part of the course we had made it onto the overpass. When I looked down to my left I could not see many runners, but when we looked to the right we could see the Balloon Ladies underneath us. We decided it was definitely time to kick it into high gear! We continued on Epcot Center Drive, ran past the mile 11 marker, and headed into Epcot. There was some amazing – and entertaining – crowd support in this area. The Mile 12 marker was right before we headed into Epcot at the backstage entrance by Nemo and Friends. Backstage we enjoyed a quick photo with Clarabelle. Once inside Epcot we headed toward Spaceship Earth then ran down to the entrance of World Showcase where you will loop around to come back toward Spaceship Earth. We had three photo stops in this tiny stretch with Phineas and Ferb, Genie, and Spaceship Earth. We then took a right at Spaceship Earth and headed backstage to get you to the finish line while enjoying the gospel choir backstage. 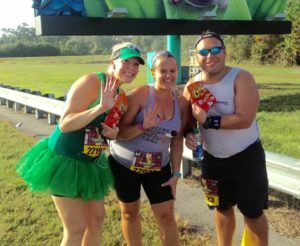 Once we passed the mile 13 marker there was no stopping us, and we sprinted to the finish line! 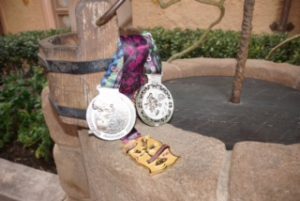 The half marathon medal embraced the same Chef Mickey logo as the shirt and was all silver. The lanyard was a green plaid design. The challenge medal was gold with Lumiere on it hanging from a purple plaid lanyard, which I was not sure I originally liked but after wearing my medals around the park it soon became my favorite! I also learned upon going back to our dark hotel room that the flames on Lumiere glowed in the dark. I loved that all three medals from the weekend had coordinated lanyards! 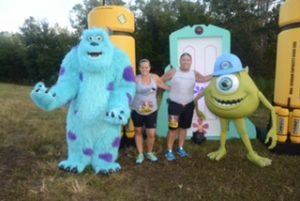 For as good as runDisney events are, the post-race experience is one area where they are lagging behind many other races. There just really is not a whole lot of noteworthy aspects of the experience when compared to other races we’ve run in the past years. We received drinks, a single banana, and our customary runDisney snack box, but again, no bags to help us carry our items. We did receive Dr. Cool towels, which were a nice touch on a hot day. Other than that? There was not much to keep us around so we went back to the hotel to shower and nap. Also, where was our beer??? In past years, when we finished this race, we were given a choice of a glass of wine or beer. But I am sure Mike will have more to say on this subject later. I recycled a lot of my playlist from the Disneyland Half Marathon while adding a lot of Beauty and the Beast into the playlist. Honestly though, I barely recall listening to my playlist because I was having so much fun running, talking, and generally being silly with Mike and Helene. This race was by far my LEAST favorite course of the RunDisney race season for the year. I was really disappointed at how far this race has strayed to what it had been the previous two years. I do not see myself running this race again unless it goes back to a night race. The post race party was on Sunday night and I found myself too exhausted to stick around and enjoy after being up since 3:30am. Honestly, that’s really all I have to say about the post-race party, which isn’t much. Take away the challenge and give me back my night race where I got to run thru three parks and no water treatment plant!